As I mentioned in my last post, I had a luau a 2 weekends ago and I made quite a few things to bring with me. This was one of them. 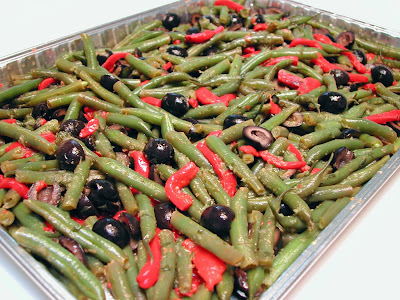 You really can't go wrong with green beans. I think most people like them and with the addition of black olives, red roasted peppers and a great basil red wine vinaigrette, it was a hit. Disposable aluminum pans like the one in the photo are really great for stuff like this. They even come with plastic covers to fit. You can even cook in them too! P.S. Don't forget to save yourself a small plate before packing it up to go or you may not even get to try it! Place all vinaigrette ingredients in a blender or food processor and blend until smooth; set aside. 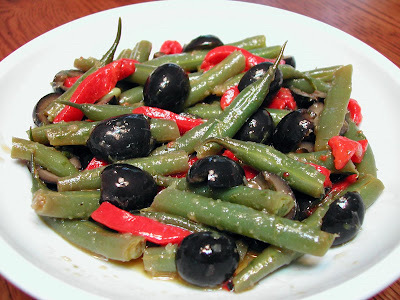 Steam green beans for about 5-7 minutes or until crisp tender. Plunge in ice water to stop cooking; drain and place in large bowl. Add the olives, peppers and vinaigrette; stir to combine. Refrigerate for at least one hour to let all the flavors blend. Serve at room temperature. This looks wonderful! Oh, I love the aluminum pans. When I end up taking my own dishes, I always forget abiout it and wished I brought the dish is a disposable pan. I like it cause it's Italian-style.